The first in-depth biography of Camilla, Duchess of Cornwall, and her remarkable transformation from pariah to popular royal consort. Thoroughly well-written, this is a believable portrait of a woman who did not seek publicity or a royal role but instead to support the love of he... read full description below. 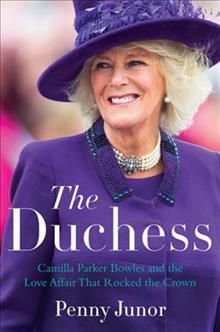 The first in-depth biography of Camilla, Duchess of Cornwall, and her remarkable transformation from pariah to popular royal consort. Thoroughly well-written, this is a believable portrait of a woman who did not seek publicity or a royal role but instead to support the love of her life, Prince Charles. -- Library Journal (starred review) Few know the Windsor family as well as veteran royal biographer and journalist Penny Junor. In The Duchess, she casts her insightful, sensitive eye on the intriguing, once widely despised, and little-known Camilla Parker Bowles, revealing in full, for the first time, the remarkable rise of a woman who was the most notorious mistress in the world, famously blamed by Diana for wrecking her marriage to Charles. In marrying the Prince of Wales in 2005, this hitherto private and self-effacing mother of two became the second most senior female member of the British Royal Family. She made him laugh again; made him a happier, more confident man, who with her by his side, will go on to be a successful and popular king. But in so doing she also made sacrifices. She gave up the freedom she had always taken for granted. She signed up to a future of public engagements, ceremonies, receptions, overseas tours, and charitable work that would exhaust women half her age. Junor argues that although Camilla played a central role in the darkest days of the modern monarchy--Charles and Diana's acrimonious and scandalous split--she will one day be seen as the woman who shored up the British monarchy. A woman with no ambition to be a princess, a duchess, or a queen, Camilla simply wanted to be with, and support, the man who has always been the love of her life. Junor contends that their marriage has allowed Charles finally to become comfortable as the heir to the British throne. British journalist, broadcaster, and author Penny Junor has covered the Royal Family for nearly thirty years. She is the author of biographies of both the Prince and Princess of Wales, their two sons, and two British prime ministers, and the coauthor of Patti Boyd's autobiography, Wonderful Tonight, which was an instant number one New York Times bestseller. She is married with four children and lives in Wiltshire, England.